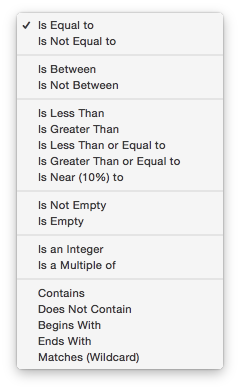 When searching in a numeric field (see Find/Select Dialog) there are over a dozen options for determining whether data is a match. Is Equal to (=) — Any data cell that exactly matches the match value will be identified as a match. Is Not Equal to (≠) — Any data cell that does not exactly match the match value will be identified as a match. Is Between — Any data cell that contains a value between the two specified match values will be identified as a match. Is Not Between — Any data cell that contains a value outside the two specified match values will be identified as a match. Is Less Than (<) — Any data cell that is less than the value in the box on the right will be identified as a match. Is Greater Than (>) — Any data cell that is greater than the match value will be identified as a match. Is Less Than or Equal to (≤) — Any data cell that is less than or equal to the match value will be identified as a match. Is Greater Than or Equal to (≥) — Any data cell that is greater than or equal to the match value will be identified as a match. Is Near (10%) to — Any data cell that is within plus or minus 10% of the specified will be identified as a match. Is Not Empty — Any data cell that contains a value (even zero) will be identified as a match. Is Empty — Any data cell that does not contain a value will be identified as a match. In other words, this option locates completely blank fields. Is an Integer — Any data cell that contains an integer value will be identified as a match. For example, 1, 2, 45 and 5,687 would match but 1.27, 9.87 and 764.12 would not. Is a Multiple of — Any data cell that is a multiple of the specified value will be identified as a match. For example if you specify 2 then 2, 4, 6, 8, etc. would match, while any other numbers would not. checkemptyselection -- notifies the user if a selection failed, and reverts to the previous selection. Date Search Options -- searching dates within a database. Favorite Searches -- saving and recalling favorite searches. find -- locates the first visible record in the active database for which the specified condition is true. Find & Replace Dialog -- finding and replacing a word, phrase or regular expression. Find/Select Dialog -- using a dialog to search for specific data. findabove -- locates the next previous record (above the current record) in the active database for which the specified condition is true. findbackwards -- locates the last visible record in the active database for which the specified condition is true. findbelow -- locates the next visible record (below the current record) in the active database for which the specified condition is true. findid -- locates a record in the active database by its ID number (see info("serverrecordid"). findnth -- finds the nth (2nd, 3rd, 4th, etc.) record that matches a true-false test. findselectdialog -- opens the standard *Find/Select* dialog. Formula Search -- searching with a formula. ifselect -- combines the select and if info("empty") operations into a single statement. info("empty") -- returns true or false depending on the result of the last select operation. If no records were selected the function will return true, otherwise it will return false. info("found") -- returns true or false depending on whether the last *find* or *next* statement was successful. info("selectduplicatesortwarning") -- works with the selectduplicatesnowarning statement to ascertain whether or not the database was sorted correctly when last search for duplicates was performed. nextmatch -- locates the next visible record in the active database for which the condition specified in the most recent Find statement is true. pleaseselectall -- makes sure that all records are selected. previousmatch -- locates the previous (closer to the top) visible record in the active database for which the condition specified in the most recent Find statement is true. Record Search Options -- searching via record attributes. Refining a Selection -- refining a selection. removeselected -- deletes all selected records from the database. removeunselected -- deletes all unselected records from the database. search( -- searches through an item of text looking for a character, word or phrase. If it finds an exact match (including upper/lower case) with the character, word or phrase it returns its position within the text item. If it does not find the character, word or phrase it returns zero. searchanycase( -- searches through an item of text looking for a character, word or phrase. If it finds a match (upper/lower case may be different) with the character, word or phrase it returns its position within the text item. If it does not find the character, word or phrase it returns zero. Searching -- searching a database to find or select information. select -- makes visible only those records for the active database for which the specified condition is true. Select Duplicates Dialog -- opens the standard *Select Duplicates* dialog sheet. selectadditional -- adds unselected records to a previously selected group if they match the true-false test. selectall -- makes every record in the database visible. selectduplicates -- selects records containing duplicate information in the database. selectduplicatesnowarning -- selects records containing duplicate information in the database. Selecting with the Context Menu -- searching for information related to the current cell. selectreverse -- makes every visible record invisible, and every invisible record visible. selectwithin -- uses a Boolean formula to exclude records from a previously selected group. Text Search Options -- searching text within a database.